Arthur Goldsborough, of Washington, DC, was granted the patents for his deadend on September 11th, 1883 and February 19th, 1884. Goldsborough had to look far and wide to find someone to manufacture his plane, and chose Iver Johnson Co, of Worcester, Massachusetts and later Fitchburg. It's in Worcester where the planes were likely cast. The planes were sold by the hardware giant, Tower&Lyon, of New York City. It's likely their clout that was able to get this albatross off the ground as it certainly is a strange plane. The plane was sold as "The Challenge" plane, which is really a befitting name for the tool as it's a challenge to find one of them unbroken let alone find one period. Most of the examples show up outside of New England, nay west of the Mississippi, where it seems a more gullible public was willing to buy untested goods. 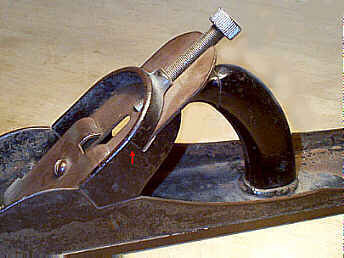 The example pictured here is a #8-size jointer, and is far rarer than the smoother and jack versions of the already rare design. The planes are a very simple design and strike one as a rather cheap blob of cast iron upon first glance. They have a characteristic arch to the casting, right where the iron is carried. The tote, which looks for all the world like a goat's horn, is a piece of grooved wood that sandwiches and is screwed to a portion of the casting that bends forward from the bed, up to the arched area, where it finally joins the arched part of the casting. Together, the tote and the arch buttress each other. The low side rails of the main casting are reminiscent of the design used on the Chaplin planes, with semi-scalloped shapes over their lengths. It's the arched part of the casting where the business portion of the plane is found. It's milled to act as the bed, but only down near the cutting edge and for a short distance along the sides of the iron. At the top of the arch, the casting is 'slit' so that the iron can fit through it. The apex of the arch carries a boss-like swelling to the casting, which is tapped to accept an adjusting screw. The iron itself is slotted to allow the adjusting screw to run a length through it, down below the arch. The screw terminates in a smaller captive slot so that the iron can be raised or lowered as the screw is turned. A cap iron, roughly half the length of the iron, is screwed to the top of the iron; the cap iron has a resemblance to the cap iron used in the common #10 jack rabbet plane in that it widens down at the business end. The planes exhibit just how much force can be placed on the plane iron, as the tool is pushed over the wood's surface. As the iron bites the wood, the natural reaction is for the iron to be thrust backward, but the iron can't be permitted to move backward or it won't cut (it's that path of least resistance thing). Whatever means is used to secure the iron, it must be strong enough to prevent the iron from being thrust backward. On the Stanley planes, as well as many others, it's the lever cap that secures the iron in place. On wooden planes, it's the wedge. But on The Challenge plane, it's the arched portion of the casting that bears the brunt of the force. All that force is transferred right to the point where the depth adjuster threads into the casting. Because of this shoddy design, most of The Challenge planes are found broken along the arched casting (as indicated by the tiny red arrow in the image). This breakage may come as a surprise to some, as I'm certain it did to the original purchasers of The Challenge planes, but it speaks volumes about the rigors placed on plane irons and the many means that are used to hold them firmly in place. Do keep this in mind, as you use your Stanley planes - if the arched casting on this plane, which is nearly 1/4" thick and 1/2" wide, can crack due to insufficient clamping pressure on the iron, the puny and fragile, by comparison, adjusting fork on the Bailey design can, and will, snap when it, too, is asked to buttress the iron's backward thrust. Naturally, the force on the iron isn't that great when taking fine shavings and/or planing an easy species of wood. However, a rank set of the iron, a tenacious species of wood, or a plank with many knots and changes in the grain, sets a perilous course for the parts replacement line. You've been warned. Copyright (c) 1999 by Patrick A. Leach. All Rights Reserved. No part may be reproduced by any means without the express written permission of the author.